Since its foundation in 2011, Dutch superyacht builder Lynx Yachts has sold five yachts measuring between 20 and 35 metres. With three of these delivered, and the remaining two under construction, Lynx has cemented itself as a serious contender in the semi-custom and fully-custom superyacht market. 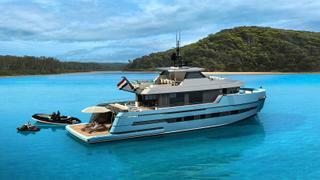 One of the yard’s most popular models to date has been the YXT 24 Evolution. 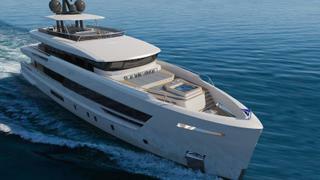 With the first model sold in 2017 and set for delivery in October and the second sold earlier this year with delivery planned for late 2019, this 27.1 metre yacht features naval architecture by Diana Yacht Design, interior design by Franck Darnet Design and exterior design by Bernd Weel which draws on the the form of support vessels. The result is huge amount of deck space capable of housing a helipad (on a dedicated version), highly unusual on a yacht of this size, along with a great array of water toys including a limo tender, chase boat, 10 metre tender, submarine, SUV, Jet Skis, quad bike and scooter, alongside generous amounts of interior space. Growing on its success thus far, Lynx Yachts presents two new projects at the Monaco Yacht Show 2018. The first, the Adventure 29, is previewed for the first time at the Monaco show and is another collaboration between the yard, Diana Yacht Design and Bernd Weel Design. The second model in the Adventure series, this 29 metre model boasts a wide beam of 8.2 metres while displacing less than 200GT and can accommodate up to eight guests split between a full beam owner’s cabin, VIP and two double cabins all with en suite bathrooms. Relaxation spaces include a large main saloon and dining space on the main deck and a bar, lounge and dining area on the bridge deck while there are also quarters for four crew. Powered by twin Caterpillar C12.9 850hp engines, the Adventure 29 can reach a top speed of 12 knots with a range of 1,900 nautical miles when cruising at 11 knots. The second project on display at the Monaco Yacht Show is the LOV 38 which was initially unveiled in July during an event at the Marina di Loano. Conceived and designed in collaboration with Omega Architects and Van Oosanen Naval Architects, this 37 metre yacht is split across four decks and has been designed to allow its owner to enjoy the ultimate blend of indoor and outdoor living thanks to a large sundeck, beach platform and optional Jacuzzi. Potential owners can choose between three interior layouts offering space for 8,10 or 12 guests across four, five or six cabins. 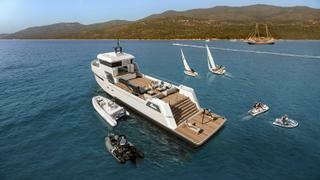 All guests cabins would be located on the lower deck while the master suite is found forward on the main deck with the option of replacing the sky lounge with a wide owner’s deck with private terrace. Dining options for 12 guests are found al fresco on the sundeck and inside in the main saloon while, for 8 and 10 guests, the sundeck boasts a Jacuzzi, bar and sun pads while dining is found outside on the main deck aft, inside on the main deck and al fresco aft of the wheelhouse. Whichever layout is selected provision has been made for carrying a large selection of water toys including a tender, Jet Ski, diving gear and more meaning, whether you intend to charter or keep your yacht just for family and friends, a great time is always guaranteed.